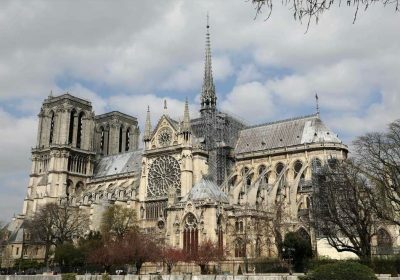 It took 200 years to build, but now a fire is gutting Paris’ iconic, 850-year-old Notre Dame cathedral in a matter of hours. The massive church — one of the most recognizable examples of Gothic architecture in the world — is being consumed by flames. The cathedral was built between 1160 and 1345 on a small island situated smack dab in the middle of the Seine River. Since then, it has played host to kingly coronations, the beatification of saints and more than a few papal visits. In 1431, a 10-year-old King Henry VI of England was coronated King of France inside the cathedral. It escaped one brush with disaster when it suffered severe damage by looters during the French Revolution. In 1905, the cathedral became property of the French government and it was designated a historic monument. Four years later, Joan of Arc was made a saint during a ceremony there. The cathedral is undergoing renovation under the French Ministry of Culture, which is responsible for its upkeep.